August 5th is Work Like a Dog Day. This got me thinking about the phrase “work like a dog”. What type of work does a pampered, suburban dog do? When it comes to Misha, she has three jobs: sniffing the neighborhood on her walk, performing in entertaining ways to amuse the family, and foraging for food. After she has her first potty stop, she runs in the house with an exuberance only matched by a five year old on their birthday. She leaps in the air 5-10 times. It’s breakfast! It’s breakfast! I don’t give Misha her food in her bowls. If I did, it would last about 3 seconds. Instead, I fill her treat toys (yes, plural). This makes a meal last 5 minutes and it burns off some of that morning energy. 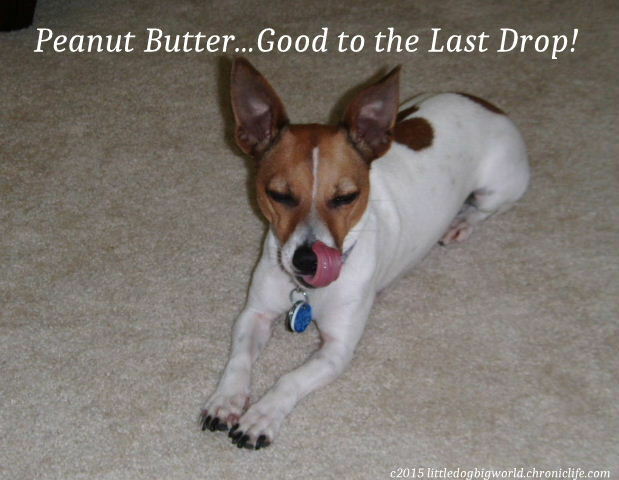 Once she has eaten, she gets a little peanut butter if it is medication day. She love peanut butter above all else. Then, she bums a couple of Cheerios off of me. After that, it is off to her tent to plot the next meal. When she hears the pantry door, she knows Grandma is having lunch. She runs into the kitchen sometimes taking her blanket with her. Just as she hoped for! Food! Then, it is walk time. She shifts her attention from food to learning all the morning news. Who has been by this bush? What is that grasshopper doing? Why are those people down the street making noise? Once back at the house, she gets a little doggie snack for lunch. This must last her an hour or two. 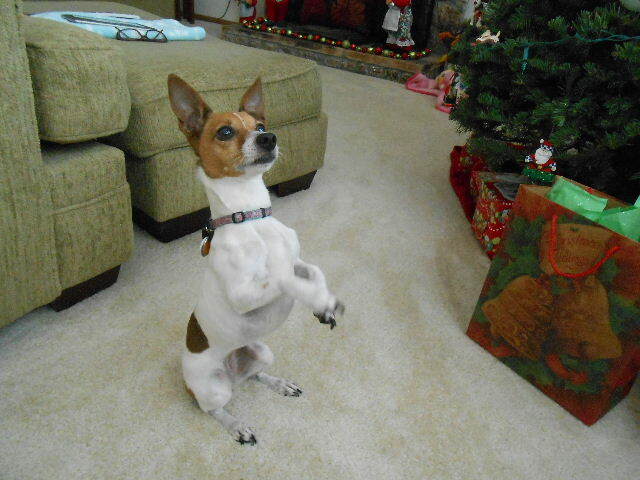 Such a long time for a Jack Russell Terrier. Don’t worry. She knows how to occupy her time. 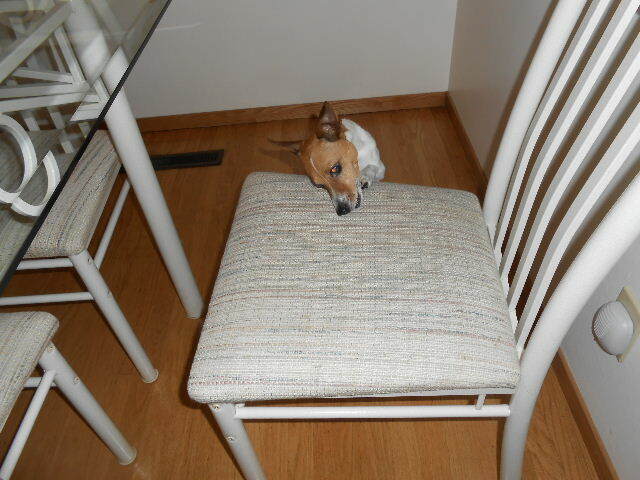 She forages in the kitchen just in case there is a crumb under the table or the cabinets. Only when every nook and cranny has been searched can she take her nap. Please can I have food? My lunch and Grandma’s dinner fall at the same time. Bonus time for Misha! She’ll get a few veggies from both of us. This is so exciting that she must run as fast as she can from her bed to the little rug where she gets her snack. Sometimes she wipes out coming around the turn. It’s the price you pay for baby carrots. Humans eat a lot of snacks. During the news, she has a chance at pieces of rice cake that may fall to the ground. Sometimes she encourages this by bumping into my legs. Accidentally, of course. Finally, it’s 5pm and dinner time. How did she wait so long? When dinner is done she runs to Grandma’s chair. She leads her into the kitchen to where the cups are, then, to the cupboard with the Cheerios. It’s very exciting! So, exciting that she leaps into the air just above the counter 3 or 4 times. It’s good to be a dog! By this time, she is tired. Time for nap with one ear alert in case sometimes opens the fridge. At bedtime, she gets a few treats. But, this is harder than all the other snack times put together because they are hidden around the house and she has to find them. 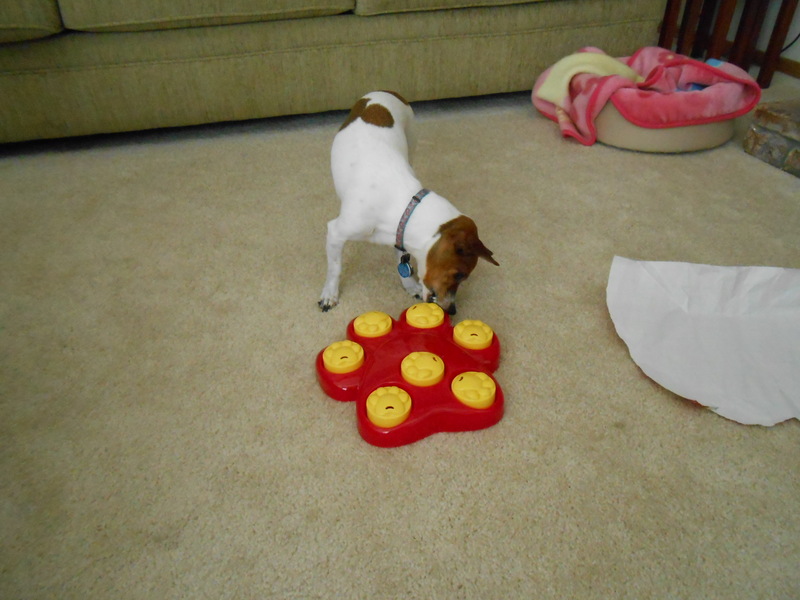 This can take 20 minutes or more which in Jack Russell time is like an eternity. Once the last treat is found, my dog can finally lays down on the bed nestled under blankets. She’s worked hard today. She needs a good night’s sleep because it all starts again tomorrow. Misha loves her dog treat toys. This give her exercise and reward her for her hard work. Never played hide and seek with your dog? See my handy, dandy instructions for playing this game with your dog: Hide and Seek: A Fun Game to Play with Your Dog.